The claws and teeth of cats and dogs can certainly wreak havoc on the interior of a home. From chewed carpets to claw marks on doors and walls, pets often damage the inside of their homes. To minimize the possibility of damage, and create spaces with lower maintenance, homeowners should select finish materials that will stand up to such abuse. Hard flooring surfaces are often a wise choice for pet owners. Tile, stone, concrete and even hardwood floors make clean-ups simple. Care should be taken when using hardwood flooring, however; large dogs can scratch even the hardest of hardwood floors. While using an high-traffic finish on the wood does help, hardwood floors will need to be refinished more often with dogs and cats in the home. Tile grout joints, stone and concrete floors should be sealed for the best stain-resistance and to maintain their look over the long term. Fabrics chosen for furniture, bedding and window treatments should be stain-resistant and easy to clean. The oils from pet fur will rub off on fabric surfaces, leaving discoloration on furniture and other soft surfaces. Polyester fabrics are easy to care for and are generally very durable. Using a fabric with a pattern, instead of a solid fabric, will help to hide stains and pet hair between cleanings. For areas of heavy use, such as a bench cushion in a mudroom or breakfast nook, using an outdoor fabric makes cleaning a breeze. Check back soon for another design tip! 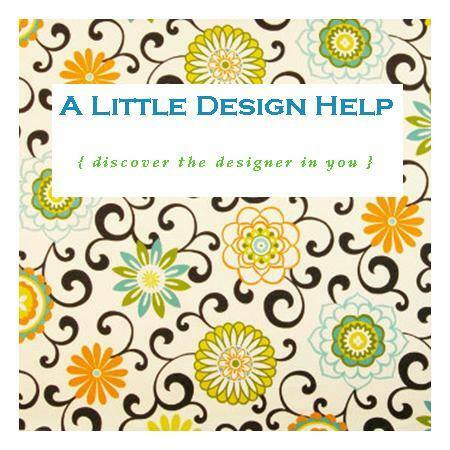 For more design articles, see Teri's other website, A Little Design Help! Click here to subscribe to Design Line, our monthly e-Newsletter, full of design tips and trends! Visit A Little Design Help for more interior design tips, DIY projects, home decor deals and more!